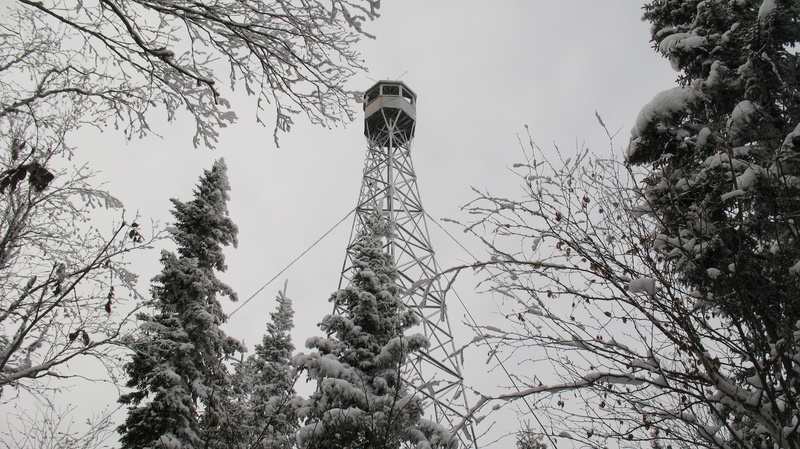 Hike up Carson Creek Peak to the Aldina Fire Tower. 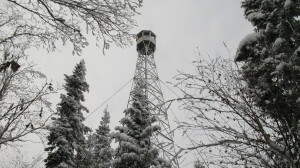 The Aldina Fire Tower is about 100 feet tall and was put up in the 60’s. Just the cupola is left up top. Carson Creek Peak is listed as the fourth highest summit in Ontario with a broad and flat summit covered by dense bush, with the spot directly under the tower being the high point of land on the summit. 00.0 km – From Thunder bay, drive west on Highway 11, turn left onto 588 to Stanley. Follow 588 for 35 km through Stanley and Nolalu to the turnoff onto North Sideroad 1.6 km (1 mile) past the junction with Route 593. Follow North Sideroad for 6 km to the intersection with Delints Road. 06.0 km – Intersection with Delints Road. At this point the road jogs left and than immediately right and continues northward. 08.2 km – Keep left at the fork. After this point the road turns west, and eventually heads south and crosses a small stream at 12.9 km. 17.5 km – Follow the road left (west) for 3.5 km from the parking spot where a quad path to Carson Creek Peak branches to the left. We parked our 4×4 vehicle here at the start of the quad trail and hiked west on the quad trail. The trail rounds the mountain to its southern flank and begins to climb gradually northward up to the broad summit. 19.6 km – Take the trail on the left (heading north) to complete the remaining 380 m to the Aldina fire tower and the summit. On our trip in we met a couple of guys on quads who gave us lots of great information and mentioned that they had recently cleared this section of trail. They had come in to this spot on their quads via Boreal Road.